Ever come across something that makes you wish you were 10 years old again? It happened to me when I did a tour of the Greenest School on Earth (that's the link to my post) in Ubud, Bali. And it happened again at Tangalooma Island Resort in Queensland recently. I was on Moreton Island, off Brisbane, to learn about a new Qantas sustainable tourism program (here’s my story about that, from The Sydney Morning Herald last weekend). While on the island, I also learned about a new eco-initiative, Tangalooma EcoMarines, set up by Penny Limbach, the resort's energetic PR and environment manager, to involve kids in conservation. 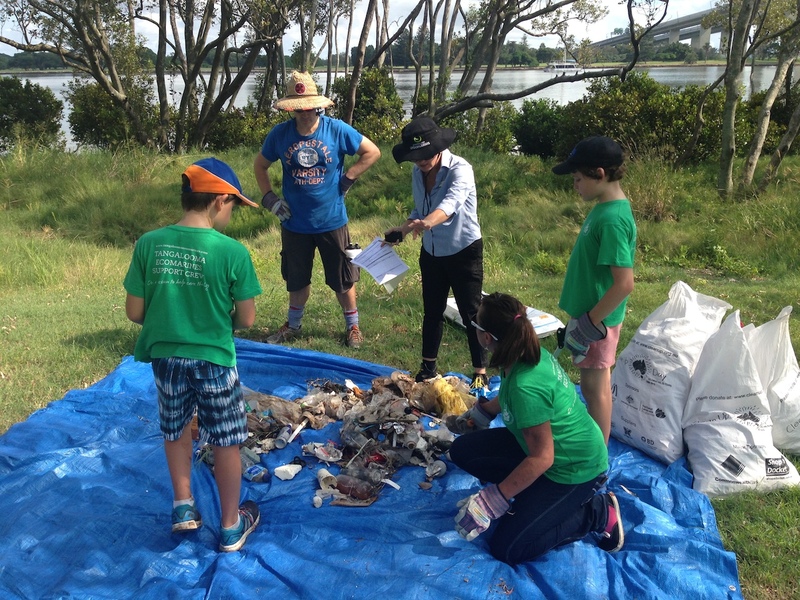 "To make a positive difference to the conservation of local waterways, ecosystems and marine life within Moreton Bay” by inspiring, motivating and educating school students, teachers, corporate groups and the wider community. What’s so special about Moreton Bay? Tangalooma EcoMarines focus on Moreton Bay for two reasons. First, it’s on the doorstep of both Tangalooma Island Resort (birthplace of the EcoMarines idea) and Brisbane (where most of the schools involved are). 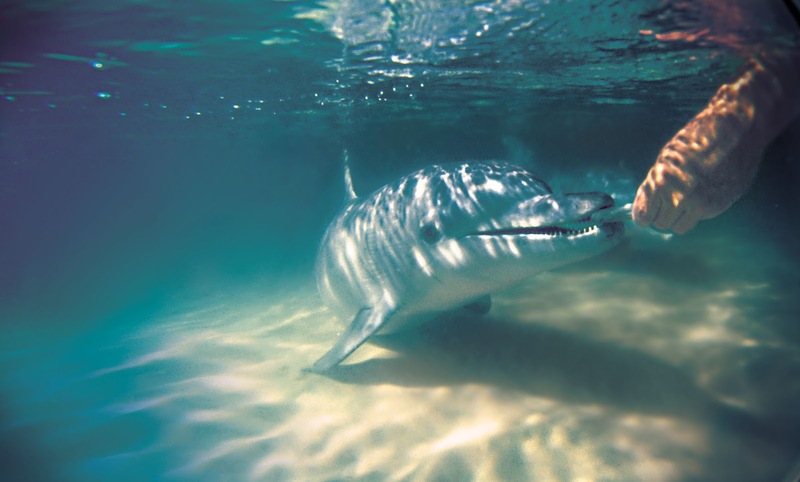 Second, Moreton Bay is the only place in the world where you can see and interact with wild dolphins (I hand-fed one at Tangalooma Island Resort, a first for me), six of the world’s seven species of sea turtles (including 10,000 green turtles), migrating whales, tropical fish and corals. Because of its seagrass, Moreton Bay Marine Park is also one of the top 10 dugong habits in the world. 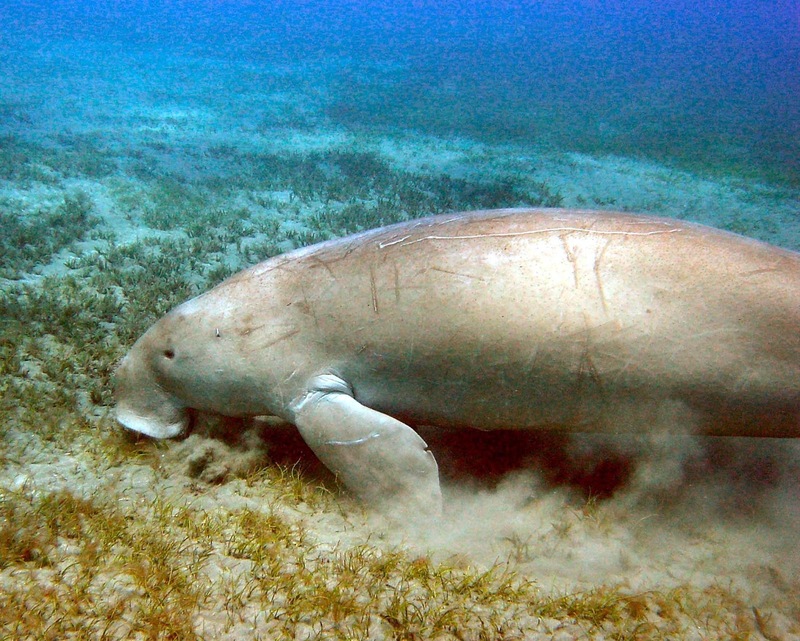 I didn’t see any when I was there, but it's the only place in the world where “herds” (a nod to their original name, “sea cows”) of up to 100 dugongs live close to a major city. Moreton Bay’s proximity to Brisbane is also its main problem. The big threats to the bay and its marine creatures are: land pollution (plastics, litter, fertilisers and land-clearing that causes run-off from agricultural land) and recreational fishing (particularly discarded and lost fishing lines, hooks and rubbish). 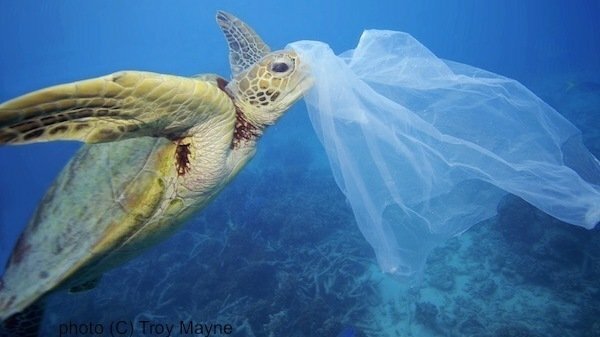 Here's a short video made by Tangalooma EcoMarines about how harmful plastic is. In what is definitely a first in Australia, possibly the world, Tangalooma EcoMarines Foundation was set up in 2014 to help save Moreton Bay, with support from Tangalooma Island Resort, Earthcheck, Healthy Waterways and several media companies. Its founding patron is Dr David Neil from the University of Queensland, who has been studying Moreton Bay’s marine environment for more than 20 years. Dear turtle, don't eat that! Any school can sign up to be involved in the Tangalooma EcoMarines (TEM) Primary School Program; it’s free and it’s easy to run. In 2014, six schools signed up. There are now 13 schools in the program and Penny is hoping for 30 by the end of this year. Each school needs just one passionate support teacher, who appoints four students, usually from Years 4 and 5, to be Tangalooma EcoMarines Ambassadors for their school. 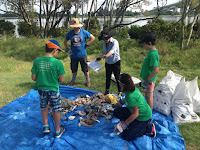 They get a resource kit containing videos, templates and information about the various Challenges they can take on (see below) to help keep Moreton Bay clean. Create Your Own Challenge: find more ways to help reduce pollution. A few new Challenges were added this year, such as Make Your Fete Eco-Friendly, Happy Clean Halloween and Screenings of Bag It (an award-winning eco-doco about plastic). My favourite is the Last Sunday Club, which sounds as fun as The Breakfast Club (great movie, by the way) and encourages anyone, not just kids, to spend an hour picking up rubbish at a local beach, park or waterway on the last Sunday of each month. Tangalooma EcoMarines recently won this year’s Healthy Waterways Sustainable Education Award. It's not hard to see why. The benefits for the kids are huge. They learn about their local environment and how to keep it healthy. 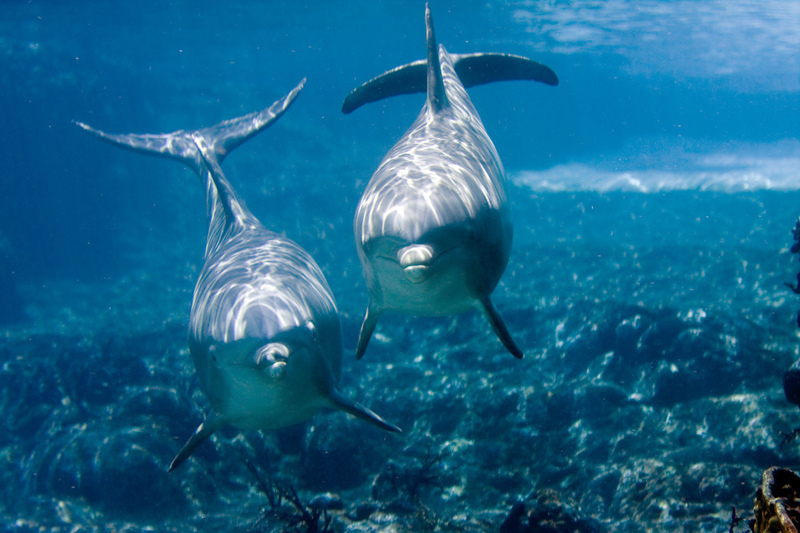 They get to take action, such as reducing plastic, to benefit natural waterways, and feel part of the "solution to pollution". And they learn leadership skills. As Penny says, “It creates leadership positions for kids who are often not likely to lead.” Win, win, win! What’s next for Tangalooma EcoMarines? The horizon’s the limit. One Queensland school recently appointed two Media Reps (budding environmental journalists) in addition to their four Ambassadors. Last year’s EcoMarine Ambassadors have become EcoMarine Champions, to mentor this year’s Ambassadors. Most excitingly, Penny is developing a regional model so the Tangalooma EcoMarines program can be adopted by primary schools anywhere in Australia – and beyond (schools in Spain and the US have already expressed interest). There’s also a pilot High School Program, which will link to tertiary and marine research institutions, and plans for Corporate and Clubs programs so people can do challenges in their workplaces and clubs. Today, Moreton Bay. Tomorrow ... the world! Have a look at www.tangaloomaecomarines.com or contact the Tangalooma EcoMarines Team on info@tangaloomaecomarines.com. You can also find them on facebook, Twitter (@TangaEcoMarines), Instagram (Tangalooma_EcoMarines) and LinkedIn (Tangalooma EcoMarines).